I mentioned in this post how bummed I was that I had barely any lilacs this spring. 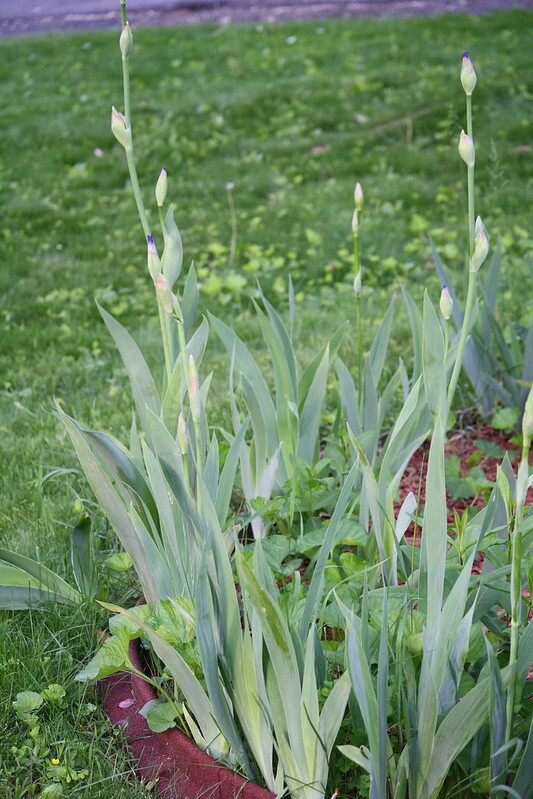 While that is still true, it appears as though my bearded irises are planning to make up for the lilac lack! 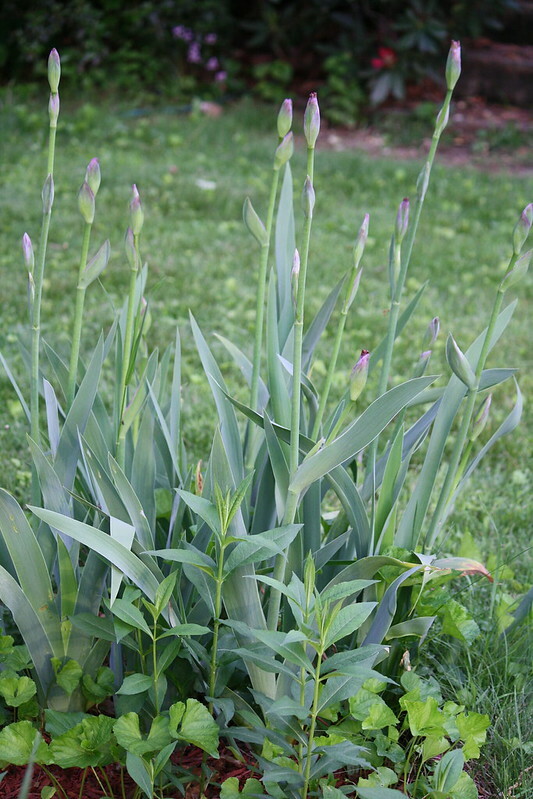 I’ve got lots of iris buds. I counted over 50 when I took these pictures! I’m thrilled with the abundance of buds. They should be opening any day now. This blog will likely be flooded with their photos in the near future. 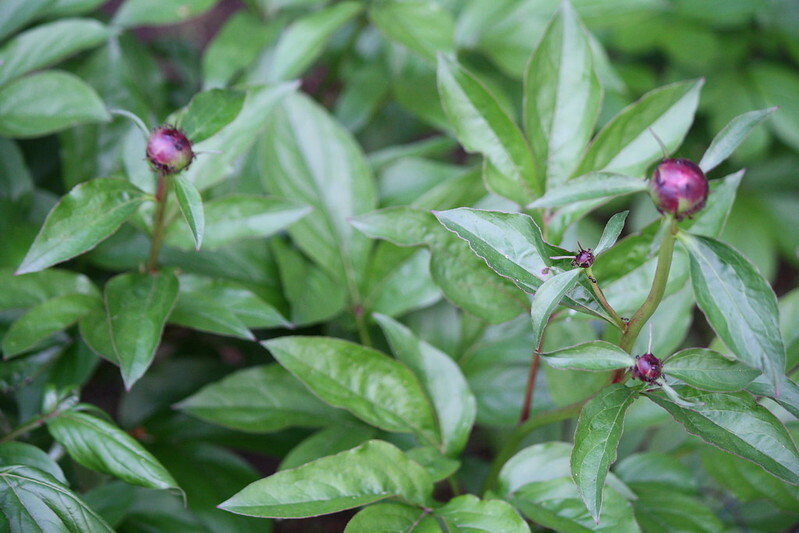 The peonies are budding too – and the ants have definitely found their way to that sweet scent. I guess you can’t call them buds, but the vegetable garden is under way as well. Despite a minor injury to my ankle that I suffered at Zumba class Saturday morning, with some help and some bribery of the teenagers in my life it is all planted. I got my girls’ and daughter’s boyfriend to do the clearing away of last year’s garden debris. 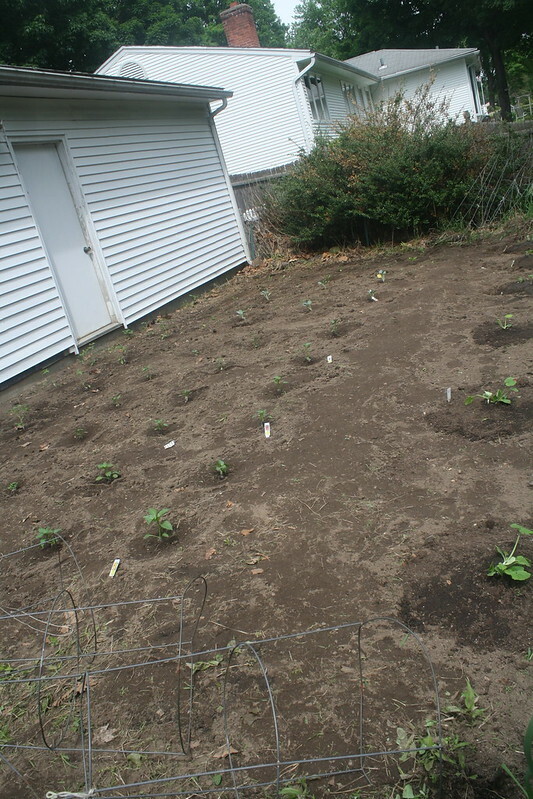 Then I was able to comfortably scoot around and do the actual planting. This year I’ve planted 2 types of tomatoes, yellow bell peppers, jalepenos, cayennes, zucchini, cucumbers, broccoli and eggplant. I’ve never had a heck of a lot of luck with eggplant or bell peppers, but I decided to give them another try. Some little critter has already nibbled the leaves of the of one of the eggplant seedlings, so we’ll see what happens there. I did plant all those annual flowers I showed you in my last post too. Those were mostly for containers, so that was easy, pleasant work. I’ve been contemplating some kind of photo challenge too. As I told you at the beginning of the year (or technically at the end of last year) I’ve been trying to focus on the simple joys this year. There have been some rather trying events for both me and someone very close to me over the last couple weeks that, while I cannot discuss them here, have affected me deeply. They have left me feeling bereft of joy at times and attempting to seek it out wherever possible. I’d like to have a joy-themed photo hunt for June. It wouldn’t be a Karma kind of hunt if I just left it at that, though, would it? You awesome bloggers so often inspire me. Would you do me the favor of leaving some joyful comments or ideas or links? I think I could come up with just the thing with a little help from my friends! Joyful comments? Oh gosh, I think I’m no help there. There are so many things that give me a feeling of joy – the lawn I mowed today, the grasses I pulled that are shriveling on the ground (I cackle like a witch as they shrivel), the shine of the windows I washed – the fact that I did all of those things in a day and wasn’t tired. You are always a help with your positive spirit Carol! Lovely! This is so good. I like your enthusiasm for gardening. The pictures give a very clear view of how the buds would look in real. Feels so fresh. Do you have rainfall in this season? I’m sure you will continue being joyful & spreading joy around and across the oceans to all of us. Sometimes, its just a passing phase.. Thank you Sonali. Yes, we’ve been having plenty of rain this spring. Makes everything beautifully green. Unfortunately the things that have happened in my life are not passing phases. They are things that will need hard work to get through. Perhaps the day will come when I will be free to talk about them in this space. I’m sorry it’s been a trying time for you, Karma. I hope things improve soon. Your garden looks wonderfully weed-free. And look at all those irises! Wow! How about photos of five things that bring you joy? Hmmm…. that’s too simple. Maybe take synonyms for joy and make a list (amusement, bliss, satisfaction, refreshment, festivity, wonder, luxury, etc., all courtesy of thesaurus.com)…? Thank you Robin. Unfortunately, most of the stuff that is happening now is stuff for the long haul. The day may come when I’m able to talk about it here, but we’ll see. It is rarely “just” an idea that brings me inspiration Kathy. It is often reading about interesting things happening to all of you or a special couple of words in a comment that makes the light bulb turn on. 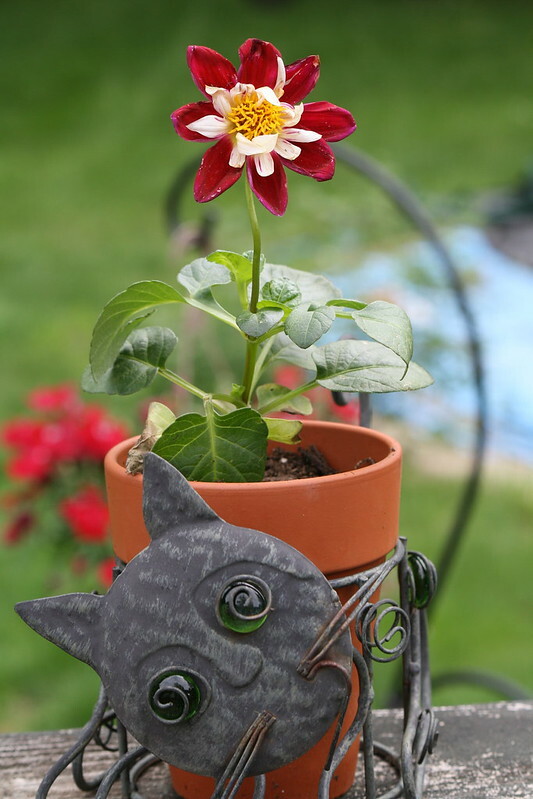 I like my silly little whimsical kitty too, Hmm, maybe some inspiration happening right now….. Thank you for the hugs – I will take all I can get! Well, I Tried to Keep the Tradition! You might like these posts – other folks did! Get email of new posts! Go ahead click it! Find all of this month’s posts here!